What a fun little filigree pendant that is cute and feminine! It is a lovely piece of chain maille jewelry, woven together into a diamond shape. It is a lightweight pendant that can go with just about anything! This chain maille pendant is approximately 1 1/8 inches long (including the ring used for the bail), by about 15/16 inch across. 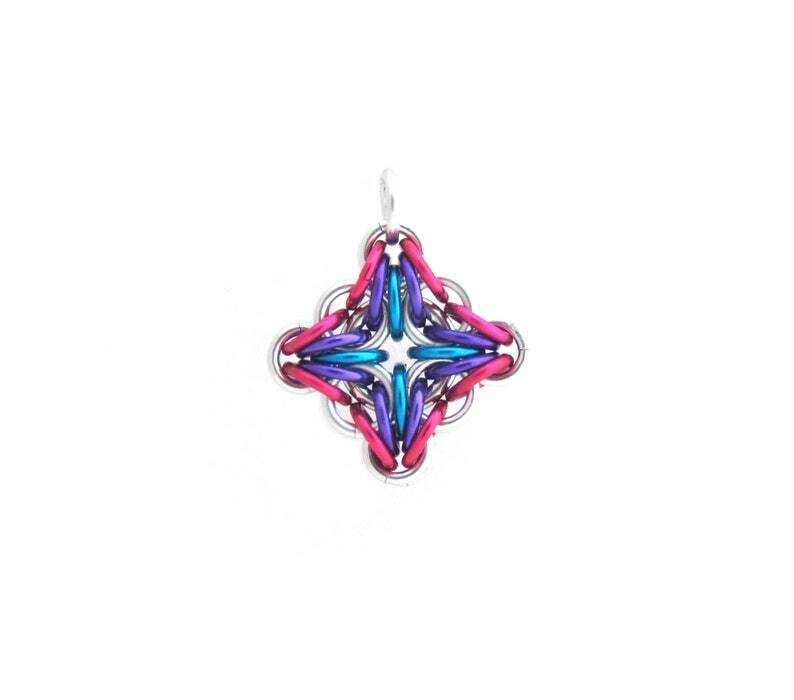 It is made with anodized aluminum in bright pink, purple, and turquoise blue, as well as silver. It is small but eye catching! If you have any questions or comments, please feel free to contact me any time! Visit the rest of my shop here! These are my recent purchases from this shop. All pieces are amazing. I already have several different color earrings and I love the pendants. Recently bought the bracelet and absolutely fell in love with it. I highly recommend this shop.